Anton C. Olson was born in Norway in 1866, one of seven children. 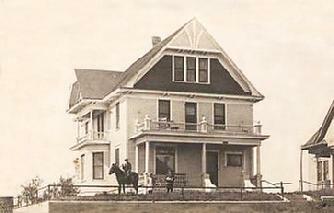 The family arrived in Mandan in June 1882. In March 1883, Anton began working for the Northern Pacific Railroad Company as a waterboy. He turned 17 the next year and started working as a regular handyman laying track. From 1885 to 1887, Anton worked on a crew on a steam shovel where he survived an incident when he was buried alive under tons of sand and rock. Through their heroic efforts, the crew dug frantically and saved Anton's life. He continued to work for the railroad throughout his career, advancing regularly, from machinist's helper in 1887 to handyman in 1890, to locomotive fireman in 1892. 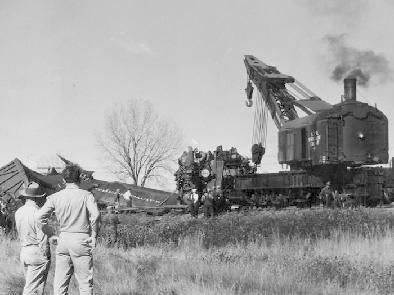 From 1900 to 1908 Anton was responsible for cleaning up all train wrecks between Fargo and Glendive; sometimes it was necessary to remove human bodies from the wreckage. In 1908, Anton advanced to locomotive inspector until March of 1936, when at seventy years of age, having completed 50 years of continuous service, he retired from the Northern Pacific RR Co.
Anton married Anna Wold on March 25, 1894, in Mandan, by Reverend Gustad. They had five children. Anton enjoyed the church choir and was on the building committee at the Lutheran Church at 225 9th Ave SW which built their church in 1891. 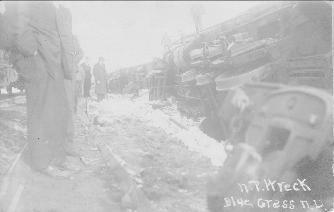 The photo to the right depicts a 1920s Northern Pacific derailment at �Blue Grass Siding,� three miles southwest of New Salem. The siding was named for the wide bladed, blue-colored bunch grass in the area reputedly brought from Kentucky by soldiers serving under General Custer.